Don’t wait until summer to find out! By then it is peak season for air conditioner installers/repairer’s and the good ones, like Electrical Embassy are booked out for months. But with a small amount of maintenance in spring, you can be summer ready and make big savings on your air conditioner running costs. OK, air conditioner operation 101. Air conditioners rely on efficient air flow to pass through the system to cool the passing air. This, in turn, cools the room. Once the room reaches the set temperature the air conditioner cycles on & off to maintain the temperature. The more the air conditioner can cycle off the less electricity it will use and therefore save you money. 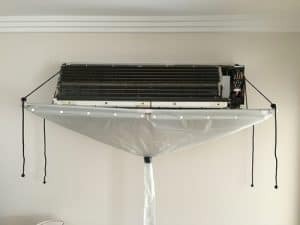 If the air conditioner is not clean this simple cycle is effected as the air does not efficiently pass through the cooling fins of the air conditioner. 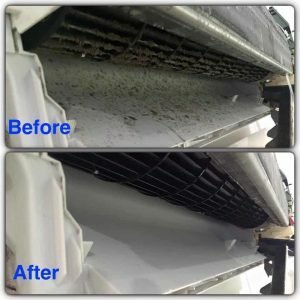 Regular dust build up can reduce airflow by up to 1% per week. This costs you more money in higher electricity usage, plus shortens the life of the air conditioner system as it is overworked. 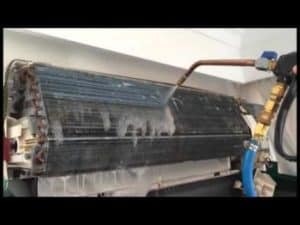 Additionally, a dirty split system air conditioner will circulate contaminated, unhealthy, dirty air. Purchase an energy efficient air conditioner. If your air conditioner system is old (7+ years), you will benefit from the newer, more energy efficient systems available now. It’s important to purchase the most energy efficient option you can when buying an air-conditioner at home. Electrical Embassy offer the most energy efficient systems on the market. Setting your air conditioners temperature. Every degree of extra cooling may increase your energy consumption by approximately 5-10%. 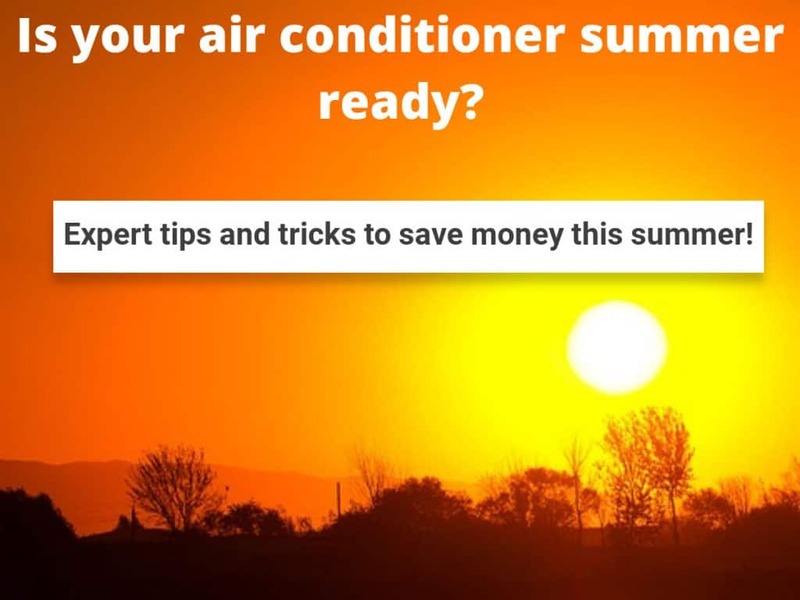 Think about the potential for savings when you set your air-conditioner at a temperature that keeps you comfortable but doesn’t use unnecessary electricity. Set your air-conditioner to an energy-efficient 24°C in summer and 18°C in winter. Seal gaps and close doors, windows and curtains to cool or heat rooms quicker and keep them at a comfortable temperature for longer. 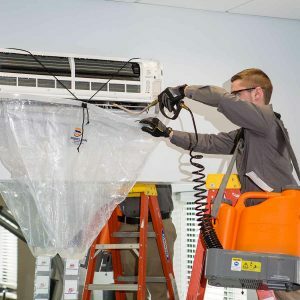 Electrical Embassy master technicians can clean and service your split system air conditioner and get you summer ready. We can also supply and install Fujitsu & Kelvinator systems at prices much cheaper than the big retailers! Call or email Electricity Embassy today! Home electrical work is a handy man free zone. The risks associated with carrying out your own repair job far outweigh the cost of getting a licenced professional in. 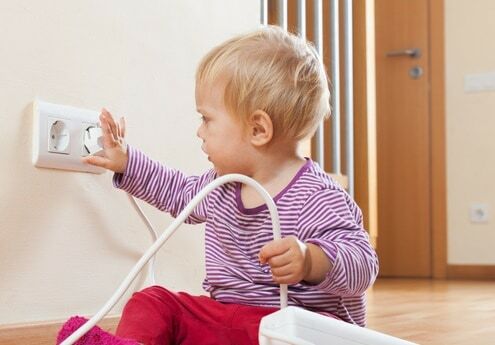 While electricity is all around us in our everyday life, it can be extremely dangerous and even lead to hospitalisation or death if something goes wrong. Use licenced electricians only! We cannot stress this enough. All work must be carried out by a licenced professional to not only keep you safe but to ensure you don’t void your home insurance policy. Install safety switches. A safety switch will prevent your home circuits from being overloaded by cutting the power if there are any surges. You can test your safety switch which we recommend you do every three months. No drinks around electrical appliances including game consoles and computers – spills and electricity do not mix! Install smoke alarms and test them to make sure they’re working. You never know when disaster can strike and early warning is your family’s best chance at avoiding injury. Test your smoke alarms every three months and change the batteries once a year. Queensland Fire Service suggests (and advertises reminders!) for April 1st to change the batteries. Water and electricity aren’t friends. Don’t leave hair dryers, straighteners, shavers or other bathroom appliances plugged in when you’re not in the room. Also don’t use them when you are wet! If you get a shock from an appliance, isolate it. If it’s a high cost item, we suggest you get an electrician out to test it. Otherwise, replacing is the best option. Don’t have enough power points? Please don’t piggy back double adapters. Either invest in a good quality power board with a safety switch or call us to install more power points for you. During the winter months, make sure you keep a safe distance around heaters. Don’t leave soft furnishings, clothes or furniture too close as this creates a fire hazard. If your appliance needs cleaning, turn it off and unplug it first. This will minimise the risk of electric shock if you bump the electrics the wrong way. Don’t forget, when unplugging, use the plug and don’t pull on the cord. Want to drill a hole in the wall? Check for concealed cables. You can invest in tools to assist with this, but a good rule of thumb is don’t drill above light switches, power points or phone outlets. When digging outside or climbing onto the roof, check for cables. You don’t want to accidentally put a shovel into the electrical line or put your ladder onto one either. Remember, look up and live, and dial before you dig. For more information on keeping your home and family safe, contact Electrical Embassy today on 07 3063 0739. Electrical safety is no joke nor is it a small job. Electrical Embassy are experts at helping you manage the risks associated with electrical appliances in the workplace. A huge step in making sure all workplace appliances are safe is to have everything tested and tagged. Electrical safety code AS/NZS 3760:2010, specifies the standards that apply to electrical safety inspection and maintenance in the Australian workplace. 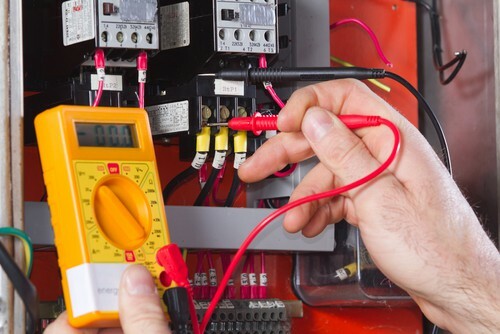 Electrical equipment connected to electricity with a flexible chord, must be inspected at regular intervals to make sure you and your employees are safe. As an employer YOU will be liable if someone is injured by an electrical appliance if appropriate testing and tagging have not taken place. An electrical injury can open a business up to legal action leading to high payments for damages relating to the injury. There are fines associated with breaches in workplace health and safety obligations which run into the thousands of dollars. In the event of an inspection it is imperative that your workplace is completely up to date with all electrical testing and tagging. An extremely important reason for timely electrical testing and tagging is insurance. Your property insurance and Workers Compensation Insurance may be at risk if testing and tagging obligations have not been met. It is the due diligence of an employer to have this work carried out. Knowing your electrical equipment has been thoroughly tested by an industry professional will give you peace of mind. It is not always possible to identify issues by sight. Once equipment is tested and tagged you can rest easy knowing it is safe to use. Electrical faults can go undetected without regular checks and these can lead to fire. Prevention is the key to avoiding fire and subsequent damage. Worker injury affects productivity and also morale. Best practice workplace health and safety creates a better performing workplace. Regular testing and tagging in accordance with the code will not reduce the risk of injury, it will protect your workplace from lower productivity. It is also important for staff morale to ensure that the workplace is safe and that you are seen to be taking care of all safety requirements. Happy staff means higher productivity and less staff turnover. We can advise you on the specifics of the regime required for your equipment, and can carry out this service for you. For more information, contact Electrical Embassy on 07 3063 0739 today. With electricity bills on the rise, we can do out bit for the environment while saving on our bills. An average household can reduce their lighting costs by around 50% a year just by making the switch to the right light bulbs. When you consider that around 12% of the average household electricity bill is for lighting, you can see the savings adding up. This is even higher for commercial premises – between 20 – 40%. As technology evolves, new products are hitting the market that will reduce not only your environmental footprint but your electricity bill. A huge game changer is LED bulbs. LED bulbs are leading the way as energy efficient technology with benefits as soon as you swap from popular CFLs. LEDs last about 10 times longer than CFLs and even longer than the traditional incandescent bulbs. An added benefit of this is it saves you the job of having to change bulbs all the time, which is particularly good if you have high ceilings or hard to reach lights. 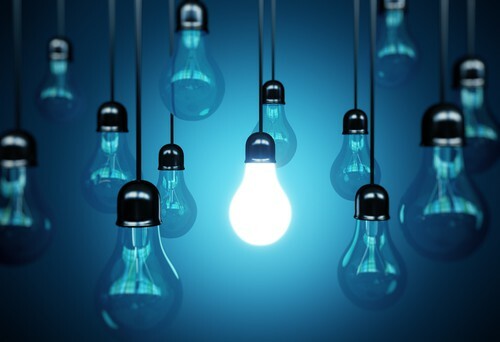 LEDs range in price depending on style from around $3 a bulb compared to $1.75 for incandescent but the LED will last for between 20,000 and 50,000 hours 5,000 to 10,000 hours for an incandescent. Not only are they cheaper to buy in the long run, they will contribute to you saving money on heating and cooling because LEDs generate a small fraction of heat that CFLs and incandescent bulbs do. The lower heat emitted also makes them a great option for Christmas decorations as they reduce the fire risk when lighting up your home for the festive season. Light-emitting diodes (LED) are semiconductors. As electrons pass through the semiconductor, it turns into light. Compared to incandescent and CFL bulbs, LED lights are more efficient at turning energy into light. This is why less of the energy radiates from the bulb as heat and why they’re cooler when in use than incandescent and CFL bulbs. A huge benefit of LEDs is they don’t just blow like CFLs or incandescent. As they age instead of burning out, they simply grow dimmer – running at 70% capacity for around 20,000 hours without you being able to see too much of a difference. From a décor standpoint, LEDs are better for creating directional light. With a range of ‘light colours’ you can choose whether you want a cool or warm light in each room. They also remove the need for lamp shades and similar shading products – costing you less. LEDs also give you the option for indoor plants as the cold light they emit can assist in plant growth, which leads to a healthier home or office environment. There are lots of different types of LED bulbs available. For help deciding the best product for your needs, just give us a call on 07 3063 0739 and we will discuss your options with you as well as what you need to install the technology in your home.